Rêve Elixir opens with the velvety smoothness of peach blossom petals, juicy pear and fresh, delicate neroli. The sun filled radiance of frangipani blossom then radiates its pure white light, like skin warmed by the sun. Next comes smooth and fruity osmanthus and the slightly woody scent of iris flower. Adding to this bouquet is the warmth of amber and sweet sandalwood, prolonged by the sleek potency of ardent cedar wood. Taking inspiration from Van Cleef & Arpels jewels, the voluptuous curved bottle, with romantic glass engraving, is housed in an intricate, lace design box. 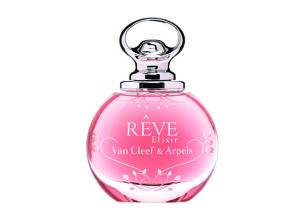 Van Cleef & Arpels Rêve Elixir smells opulent, sophisticated and expensive. This sweet, powdery, woody bomb is the ultimate feminine scent. Rêve Elixir is the perfect summer date-night choice with excellent sillage. This perfume is a must-have for lovers of sweet scents. Gorgeous pink juice in a truly exquisite bottle. The packaging is absolutely beautiful wit the flower cut-outs and darker pink showing through. Really eye-catching! The bottle is feminine and pretty. The scent lasts about 5 hours on me, and I can only describe it as a combination of fruity, fresh and warm notes. I could detect a hint of pear when I first sprayed it.